S (Scripture): Psalm 82:1 God stands in the assembly of El; in the midst of the gods he renders judgment. 8 Rise up, O God, and execute judgment on the earth! For you own all the nations. 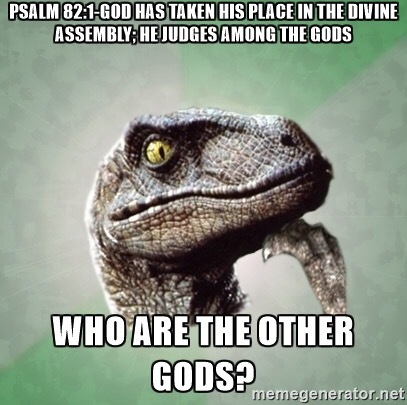 God is imagined to be standing in an assembly with all of the gods, chastising the other gods for not acting justly. And so, God judges the others…noting that they will all fall away…just like earthly rulers, they will not last forever. A (Application): I certainly sense other gods in my midst: the draw towards money, fame, laziness, self-satisfaction, etc. These are our competing gods. What are the gods that compete for your allegiance? I struggle everyday with these gods…but I shouldn’t feel that is necessary. Our God stands above all others. All other gods will fall away. The allegiance I give to these other gods is in vain. But I do it anyway…ugh! P (Prayer): Lord, not all of my actions or thoughts are resolved. I do the things I shouldn’t. I pay attention to the other gods around me. Help me, God of grace and mercy. Amen. This entry was posted in Digging Daily and tagged God, Gods, Grace, Psalm. Bookmark the permalink.